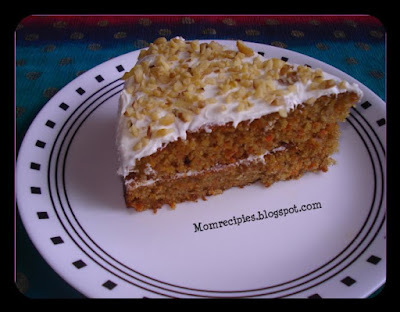 My daughter was asking me to make carrot cake as she heard in one of her poem that carrot cake is yummy.I was happy to bake a cake for her.This recipe is very easy to make and healthy.The Cake came out moist and tasted very delicious.My daughter loved the cake very much and she wanted me to save the cake for her lunch box for next day morning .My daughter complemented that Carrot Cake is really very Yummy and she wanted me to make this cake only again and again. 1) Preheat oven to 350 degrees F (180 degrees C) and place rack in center of oven. 2) Butter 9 x 2 inch (23 x 5 cm) cake pan and line the bottom of the pan with a circle of parchment paper. 3) Toast the walnuts for about 5 minutes or until lightly browned . Let it cool and then chop coarsely. 4) Peel and grate the carrots finely. Keep aside. 5) In a large bowl whisk together the all purpose flour, baking soda, baking powder, salt, and grounded cinnamon.Keep aside. 6) In another bowl , lightly beat the eggs about 1 minute. Then add the sugar and beat until the batter is thick and light colored about 4 minutes. Add the oil and vanilla extract. 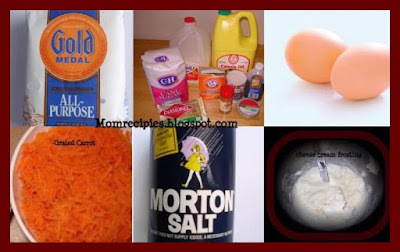 7) Mix the dry and wet ingredients together and beat just until combined. 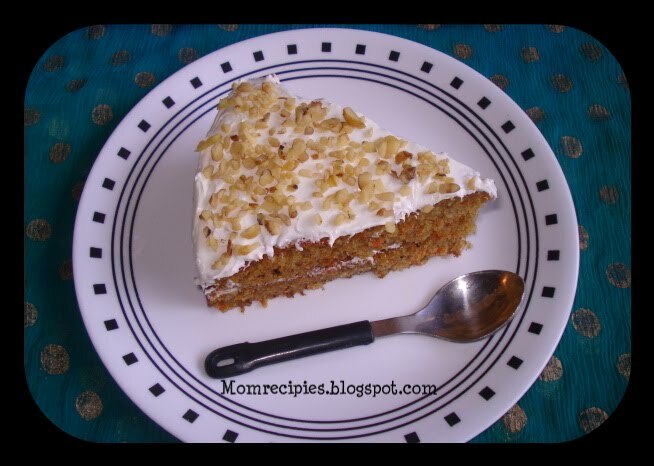 8) With a spatula fold in the grated carrots and chopped walnuts. 9) Pour the batter into a lined and greased baking pan. 10) Bake 25 to 30 minutes or until a toothpick inserted in the center comes out clean. 11) Remove from oven and let it cool on a wire rack. After about 5 minutes invert the cakes onto the wire rack, remove the pans and parchment paper, and then cool completely before cutting and frosting.Garnish toasted and finely chopped walnuts. 12) Cover and refrigerate leftovers. In bowl with a hand mixer beat the cream cheese and butter, on low speed, just until blended with no lumps. Gradually add the sifted powdered sugar and beat on low speed, until fully mixed and smooth. Beat in the vanilla extract. Carrot cake looks lovely and moist and very delectable. Creamy delicous love the topping. 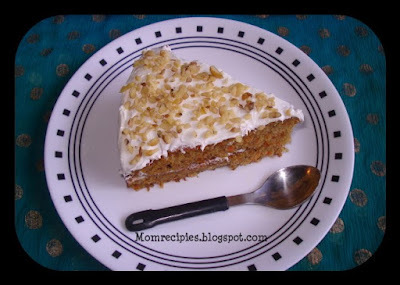 I love, love carrot cake! I'm surprised to see that apple sauce is an ingredient. I'd love to try this out.